Much like diffs, portions of images can be reviewed. This is useful when presenting screenshots of a new dialog, for example, where the design and layout of the dialog is as important as the code constructing it. To begin reviewing an image file, just click the thumbnail for the file attachment on the review request page. To place a new comment on part of the image, simply click and drag to select the desired area. This will pop open a new comment dialog, just like in the diff viewer. 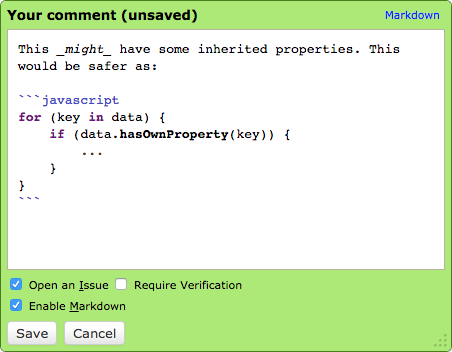 Comments support rich text using the Markdown language. See Using Markdown for more information. The file attachment comment dialog supports issue tracking. See the section on Issue Tracking for more information. Once you’re done writing your comment in the text area, click Save to save the comment. A rectangle with a green number box will appear in the region you selected to indicate that you have a comment in that area. Click the box to pop open the comment box for your existing comment again. When your mouse cursor is over the image, regions representing other comments may appear with blue number boxes in the corner. Each of these is a comment someone has made on another review. If you move the mouse cursor over the region, a tooltip will appear showing a summary of the comments made. If you click on the region, the comment dialog will appear, along with a blue side panel on the left showing those existing comments. You can still write new comments in the green area of the comment box. It’s important to note that this is not the place to reply to those comments. When you add a comment from the diff viewer, it’s creating a new top-level review (akin to a new thread). If you want to reply to existing comments, you can do so from the Reviews page. The Reply link here is a shortcut to jump directly to the relevant comment on the Reviews page. The view here is meant to be used only as a reference to see if other people have already said what you plan to say. As explained in Reviewing File Attachments, you can view and compare revisions of an image file attachment. When viewing interdiffs, Review Board has several different methods of diffing images. The options to select an image diffing method appear when you view an interdiff of two image revisions. Two-up diffing simply places the two revisions of the image beside each other. Difference diffing displays a new image where each pixel color is the RGB (Revision X - Revision Y) difference of the two image revisions. Split differing provides a horizontal slider to ‘wipe’ a vertical divider left to right from one image revision to another. The first revision will be on the right of the slider line, and the second revision will be on the left. Onion Skinning uses a horizontal slider to ‘fade’ from one revision image to another. When the slider is at the half way point, you will see a both image revisions semi-transparently overlaid on top of each other. Moving in a given direction will fade one image in and the other out. For images that are too large or too small to display comfortably, you can zoom in or out using the zoom menu to the top-right of the image’s display area. This offers 33%, 50%, 100%, and 200% zoom levels. When viewing an image file that contains a @2x identifier in the filename (common for high-DPI images for first-generation “Retina” displays), a 50% zoom level will be chosen. Similarly, files with a @3x in the filename will use a 33% zoom level. If the image is too large to fit when viewing the page (even factoring in the default zoom level for high-DPI images), a zoom level that best fits the image on the page will be chosen automatically.